While the car market in Japan has been rising by approximately 15 percent annually since 1988, motorcycle sales have been falling by 5 percent every year, and dipped below 400,000 units in 1991. Motorcycling is mostly a leisure activity in Japan - apart from the under-50cc machines, of which 1.2 million were sold in 1990. The constructors have fallen into their own trap by launching themselves on the slippery slope of building ever more expensive supersport bikes that appeal only to a minority. The Japanese factories are attempting to win back a wider public with more realistic machines. Currently the popular themes are American-style custom bikes, "basic" sports bikes stripped of every unnecessary accessory and "classics," in which a nostalgic image is served up in every conceivable guise to cloak the latest technology. 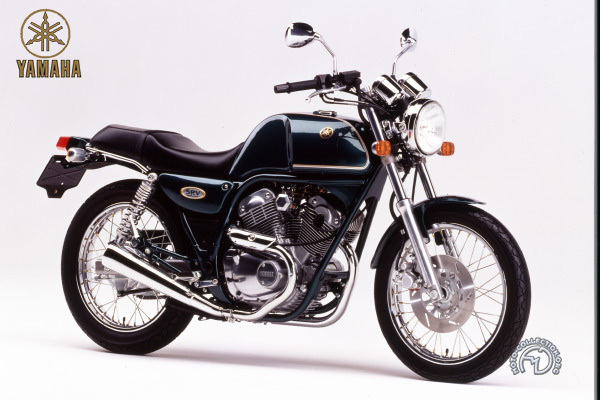 One of the more recent examples of this is the SRV 250 Yamaha, launched in Tokyo in 1991, initially reserved for the domestic market. Its V -twin engine is taken from the XV 250 custom bike, and its general appearance is intended to recapture the spirit of the British bikes of the 1950s. Finished in elegant metallic green or aggressive yellow, the SRV 250 is an excellent bike for everyday use. Flexible, but not short of character, it has a peak torque of 18 lb ft. It is well-finished and affordable, thanks to the use of conventional technology appropriate to the restrained use for which it is intended. Its sole luxury is a flexibly-mounted engine to eliminate harmful vibrations. Sensible and comfortable under its 1950s-style exterior, the SRV 250 is an attempt to recapture the japanese market.